New Holland has extended the award-winning TS-A tractor range by adding three new ‘TS-A Delta’ models and introducing a number of enhancements to existing models, now designated ‘TS-A Plus’. The launch of the TS-A range two years ago was acknowledged as a quantum leap in terms of operator comfort and operating efficiency in the highly competitive 100 to140 Hp multi-purpose tractor sector and these latest changes will ensure the TS-A range maintains its lead over the competition. The three new ‘Delta’ models are aimed at buyers that want a flexible, general-purpose and economical tractor, while the rest of the TS-A models have been improved to a degree that more than justifies the ‘Plus’ designation that they now carry. At launch, the TS-A range had a clear focus on high technology, with features such as four-valve common rail engines delivering the best torque performance of any tractor in this class, while New Holland’s Engine Power Management helped the range deliver phenomenal power-to-weight ratios. Intelligent, auto-shifting transmissions ensured that the TS-A appealed to buyers looking for a high-performance tractor for primary and secondary cultivation or hay and forage production where high power at the PTO was required. However, two key elements were identified as requirements that the TS-A range did not address. The overall height of the tractors limited access to some buildings, while other buyers were put off by the high levels of basic equipment. To address these concerns, three new, low-profile Delta models have been added to the TS-A range to widen the list of tasks that these all-purpose tractors can handle. The new models, which feature new engine specifications coupled to simplified transmissions and hydraulic systems, are ideally suited for loading, mowing, haymaking, fertiliser / manure spreading, and general haulage – or any application where operating costs need to be kept to a minimum. Comfort remains a priority on the new tractors. The TS-A’s Horizon™ cab set new standards for comfort and the newly launched low profile Horizon cab carries on that tradition despite the fact it is lower than the standard cab. The revised cab - which along with a shorter exhaust pipe gives a 150mm height reduction - still features a loader view window, as many of the new tractors are expected to be fitted with a factory loader package. Designated the TS100A Delta, TS110A Delta and TS115A Delta, the new models are rated at 74kW (101hp), 83kW (112hp) and 85kW (116hp) respectively. All feature two valves per cylinder and mechanical fuel injection engines and are specified with16x16 Electro Command - four-speed powershift or the optional Dual Command - two-speed powershift transmission. The tractors feature a fully mechanical hydraulic linkage that is simple to operate and simple to maintain. Powered by a 63 litres/minute hydraulic pump, the hydraulic system also comes with the exclusive Lift-o-MaticTM system that provides all the features and convenience of electronic linkage control – including Auto PTO and Auto diff-lock control – without the complexity. A dedicated hydraulic steering pump ensures loader cycle times are unaffected when manoeuvring. The remaining tractors in the TS-A range have been re-designated TS-A Plus and have received a package of enhancements including the option of a new, economy 17x16 40kph gearbox that allows maximum travelling speed at low RPM to ensure lower fuel consumption. The Eco Drive 40 kph transmission utilises the TS-A’s unique 50 kph Direct Drive hardware. Engine power passes down the PTO shaft and is then taken through the 17th gear directly to the rear axle. The difference with the Eco 40 kph version is that the engine will automatically reduce its speed once 40 kph is reached. The combination of the lower engine speed and the fact that the main transmission is in neutral when 17th gear is engaged, can reduce fuel consumption by as much as 10 per cent* when operating at 40 kph. In addition, all the TS-A Plus models are supplied with Comfort RideTM cab suspension as standard. In conjunction with the Horizon™ cab, driver comfort is assured and can be further improved with the addition of front axle suspension on the TS-A Plus models. The exclusive FastSteerTM system can be specified on any TS-A Plus tractor. This multi-award winning design delivers full control of the steering by turning the steering wheel by just 8 degrees, significantly reducing operator fatigue. The unique New Holland Supersteer™ front axle is also available across the TS-A Plus models for the best possible turning performance, especially in row crop applications. New Holland’s Terralock™ traction management system is fitted as standard on all TS-A Plus models. It automatically controls four-wheel-drive and differential lock engagement for mounted and trailed implements. Excluding the TS100A Plus and TS115A Plus models, TS-A Plus tractors feature electronic fuel injection and New Holland’s variable engine power management system. This boosts the rated power to 101kW (137hp), 106kW (147hp) and 119kW (162hp) for the TS110A Plus, TS125A Plus and TS135A Plus, respectively. Transmission choice includes the 16x16 Active Electro Command, as well as the Eco Drive 40 kph and Direct Drive 50 kph versions. Electronic Draft Control is standard across the TS-A Plus tractors. This features a 113 litres/minute hydraulic closed centre load sensing pump as standard. A dedicated 40 litres/minute pump supplies the tractor’s power steering circuit. The revised TS-A line-up, which now features eight models rated between 74kW (101hp) and 100kW (136hp), is the most comprehensive yet. 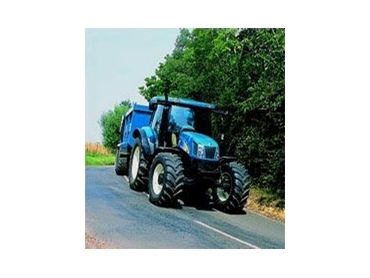 Overlapping perfectly with the TL-A at the lower end of the power range and the TM and TVT at the higher end, it demonstrates a level of choice that is only available from a specialist like New Holland.